. Little dogs are prone to dental issues, but when you add in a healthy dose of early life malnutrition and neglect you end up fighting a war to keep a wee-dog's pearly whites healthy. One of the side effects of the traumatic and abusive start to Lucy's life is troublesome teeth and yesterday we had to lose a couple of battles in our effort to win the dental war. 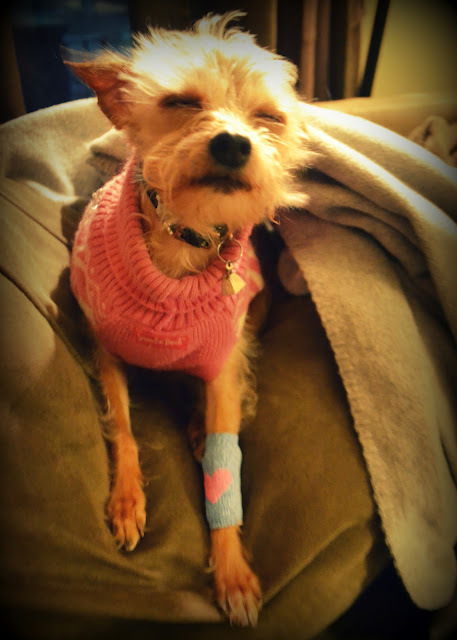 Our little pup had to have several teeth pulled during her routine cleaning yesterday. Whopping doses of pain killers and antibiotics have left Little Lu droopy eyed and little loopy, but she'll be fine in no time. I just can't wait until she stops moaning! Poor little thing; if she has one more extraction in the front of her mouth her tongue will hang out permanently. How pitiful would that be? Also - is that a leg warmer? !